How do you like the digital display? ...and doesn't go down the freeway at 4000RPM. Thanks. Now my shorts are full of sperm. ...and doesn't go down the freeway at 5000RPM. Beautiful car! I've been debating selling both Evos and getting something really nice like this or a GTR. I just can't get over how fun Evos can be for so cheap though! If you can really do it, you are foolish not to. The dual-mode exhaust is basically straight through when all 4 valves are open so no need for a catback. That was one of my favorite things about the C6, the Z06 dual mode exhaust. Quiet or straight pipes. So, anything about the X that you miss or wish this car had? Can't believe you are already happy with 4500rpm, the NA motors keep getting faster until redline. I miss three things about the X: The Rockford Fosgate stereo system, the manual parking brake lever, and the roominess of it. The C7 does have a fairly small interior, comparable to a S2000 but with more storage space and two cup holders It is very comfortable though and was fine for my 6 hour drive on Saturday besides for my foot getting sore since I couldn't use cruise control during engine break-in. The exhaust is no louder than a regular car and the suspension very compliant for a sports car while in Touring Mode. The Bose 9-speaker system is good, it just sounds a little flat compared to the Evo's Rockford system. The electronic parking brake switch is irritating vs. an actual lever, but it works, and the nice part is it auto-disengages when you put the car in gear and release the clutch. Other than these minor complaints, the car is absolutely amazing and is deserving of all the praise and reviews it's received since coming out! The engine is a powerhouse, the clutch is light and smooth (twin-disc), and the shifter/transmission is smooth, tight, and short! It's no S2k shifter, but its damn good. The handling seems super human, where the Evo would start getting jittering and making my nervous this just keeps on gripping and hanging on seemingly always wanting to be pushed faster. One feature I am really loving is how everything is integrated together between the dash gauge display and the navigation/radio screen. The turn-by-turn nav prompts show up in the dash display when needed...same with the radio stations, song title, artist, etc. when you're changing or selecting them. Last edited by Kracka; 04-14-2014 at 09:31 AM.. I think you'll get used to the electric parking brake, I did and actually prefer it now. I'm actually researching how to put one in my GSX to go along with a brake upgrade. You're probably right. I do like how it also acts as a hill-assist from a stop on an incline. hill assist is a very handy feature! This car is a rolling computer! Got in my car this morning, fired it up, noticed the touchscreen going through a strange rebooting sequence, then saw there were quite a few new options under the Home --> Settings --> Vehicle menu! The car now has the ability to auto-lock the doors when I walk away from it plus a few various other things (supposedly updated nav maps/POI's as well). Pretty cool! I guess Chevy must have updated it via OnStar's 3G connection. Yea, I am guessing through onstar's. I love my dads c6. 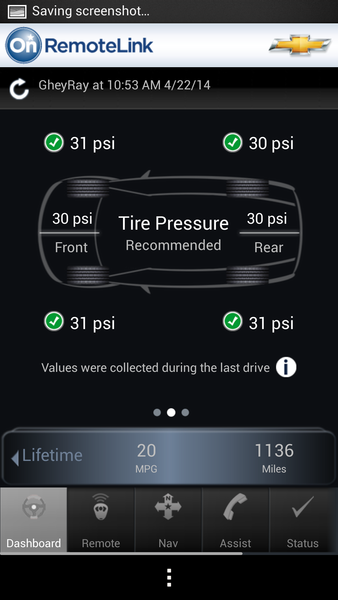 He gets emails from his car saying if his tire pressure is low and what not, pretty damn cool if you ask me! I think there is a slew of diagnostics it runs then it can be setup to alert you if you need to perform maintenance. I am guessing eventually dealerships will just know when cars need maintenance (i am guessing some have this already, besides just mileage guesses i mean) which will be handy. 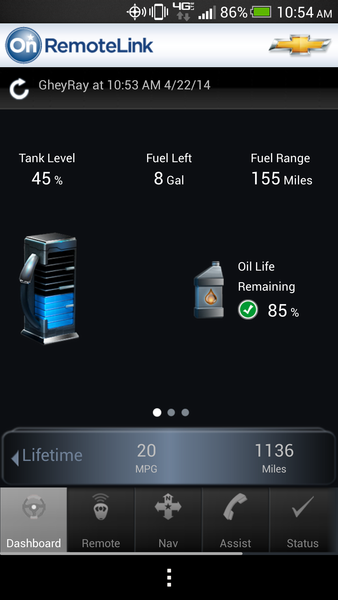 OnStar's phone app allows me to remotely check tire pressure, fuel level, the odometer, lifetime MPG, remaining oil life, lock/unlock doors, honk the horn & flash the flights, plus see it's current GPS location. 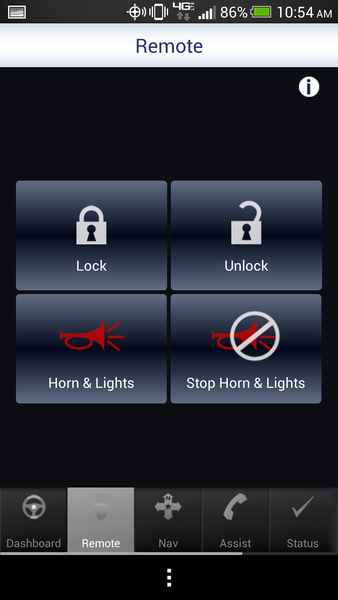 It can remote start the engine if you have an automatic transmission. 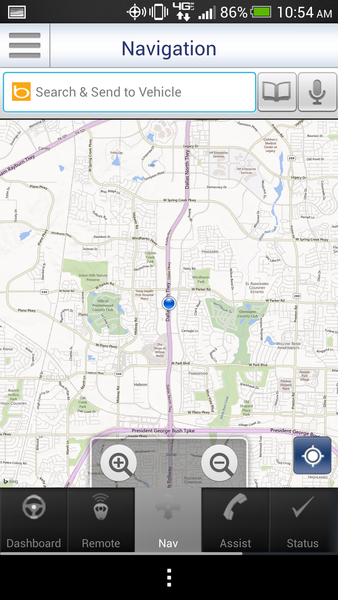 It can send nav directions from my phone directly to the in-dash. It will also email me when maintenance is coming due plus alerts my local dealership who I'm sure will call me to get a service scheduled (free oil changes for 2 years). Is that app new with the c7?